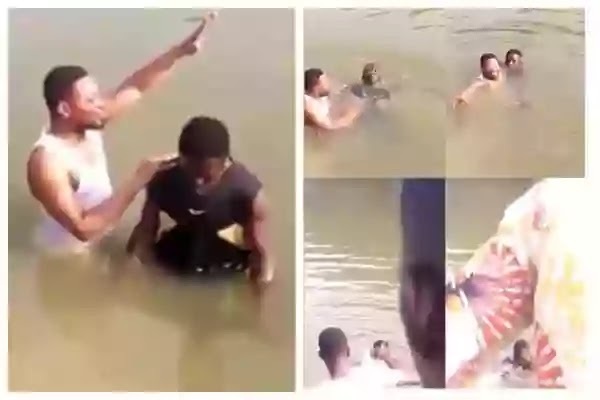 A Ghanaian pastor has been arrested, after a member identified as 20-year-old Yaw Kyeremeh drowned during baptism in a river in Accra. In what was obviously a baptism gone wrong, Kyeremeh, in a black shirt, is seen stationed at the banks of River Densu, together with a pastor, in a white singlet, who immersed him in the water in a video circulating on social media. Accra Regional Police Command spokeswoman, Afia Tenge, revealed that a junior pastor had been arrested at the scene while police were still searching for the head pastor of the church involved in the baptism.